Suddenly it was time to cut the cake. 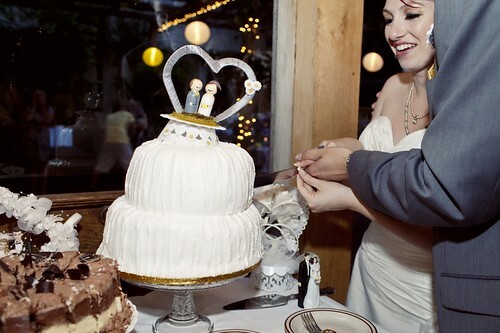 Cutting the cake is one of those things that you give a lot of thought to every other aspect but the actual cutting part. Which layer do we cut? How do I do this? Where’s my beer? 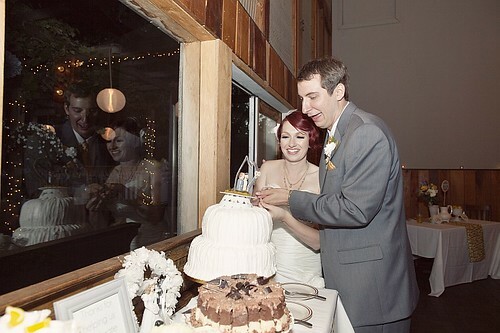 I had collected several vintage cake toppers for the dessert bar, but handmade one for our ‘official’ wedding cake. Remember these little guys? Don’t fall over mini Jessi and Jacob! 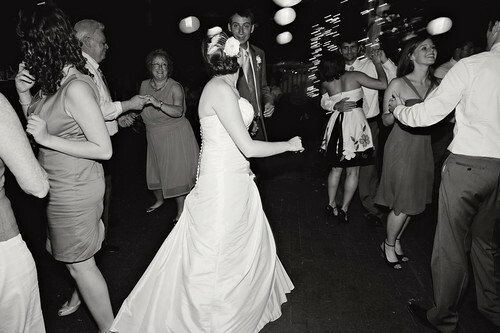 Then it was time to start the dancing! My dad and I danced to She Drives Me Crazy by Fine Young Cannibals . Go ahead and listen. It’ll make you smile, I promise. I couldn’t imagine doing a cheesy slow dance with my dad and when I was little we used to listen to She Drives Me Crazy and dance around in the living room, so it was the perfect choice. 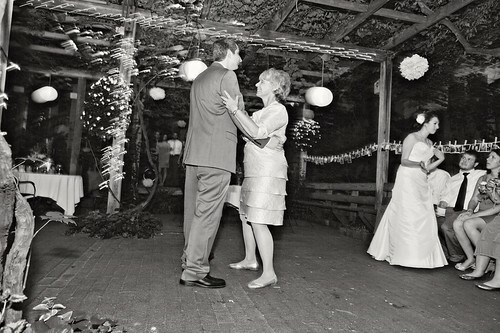 Similarly, Jacob and his mom danced to a song that was special to them and equally as adorable. The next song was the Anniversary Dance. 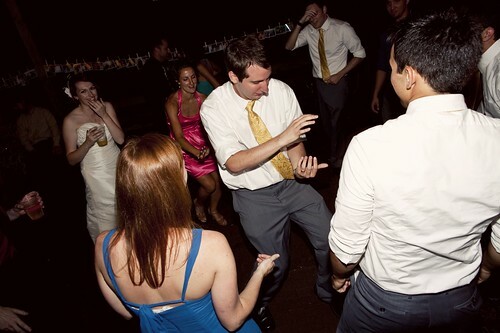 We did this in lieu of the always awkward garter/bouquet tosses and to get everyone out on the dance floor. 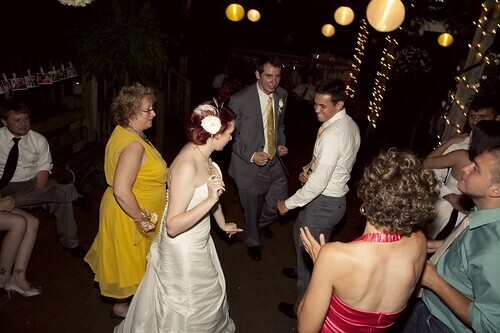 Wes asked for all of the married couples to start dancing. After a minute or so he asked everyone who has been married less than one year to step aside. 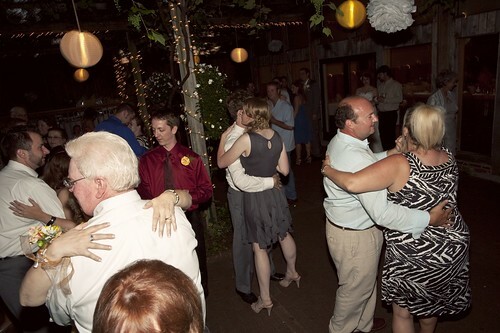 Then he moved on to 5 years, 10 years etc.. until only one couple remained on the dance floor (the longest married couple). 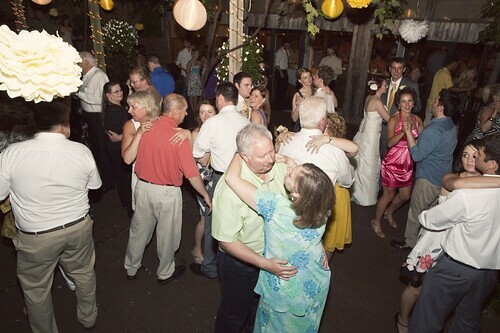 I knew that this couple would be my grandparents but wasn’t sure that they would make it out the dance floor so I was a little apprehensive. Fortunately, they made it outside just in time and we presented them with my bouquet. After which, of course, it was time to break it down. Apparently I couldn’t be bothered to put down my beer for any of the pictures. 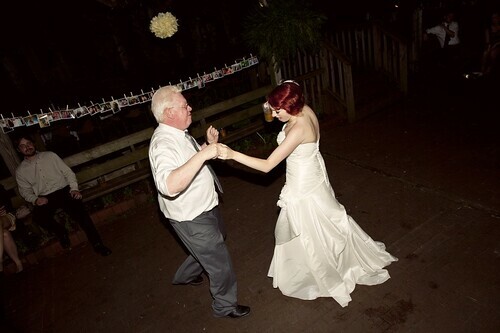 Me and my dad dancing to Dancing in the Dark by Bruce Springsteen (with another beer, you’ll notice). While the dance party was getting crazy outside, the photo booth was going strong inside. 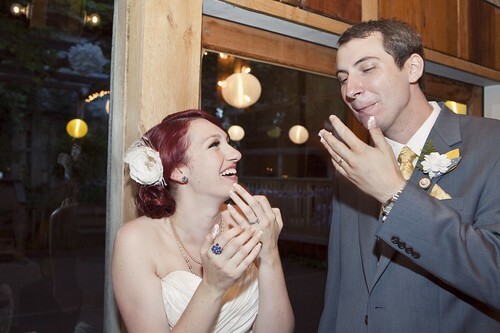 The photo booth was one of my favorite parts of the reception. We had planned on having a ‘fauxtobooth’ from the beginning (because renting the real ones start around$1000! what the what?!) with either a polaroid camera or our mac book’s webcam with this software I had won on a blog giveaway, but neither of those options were very high quality. Luckily, a few months before the wedding the Beatys announced that they were starting to offer their very own photo booth appropriately titled, the Beatybooth. Perfect! I collected fun props and painted a design on a sheet as our backdrop and in return we got some hilarious pictures. 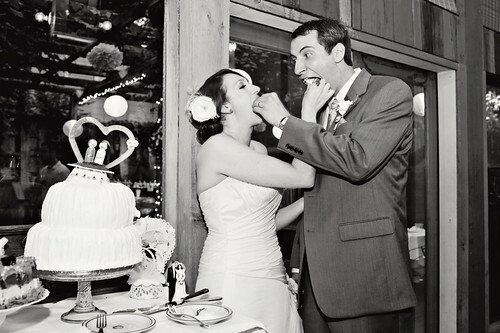 If you’re considering a photobooth at your wedding or party, I highly recommend it. It’s a great way to get pictures of guests that aren’t in any other wedding photos, and some of my favorite pictures from the whole wedding are from the Beatybooth. 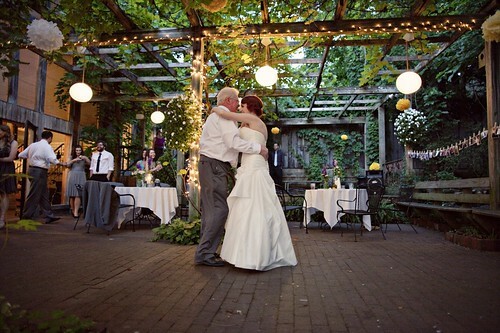 with our wedding playlists was connected to the Garden Room’s sound system that played both inside and outside. Long story short, the music wasn’t loud enough for our partying tastes, so we moved the ipod from inside and plugged it directly in to the rented speakers outside. While there was no longer music inside, those people were mingling and/or waiting in line for the photobooth so they didn’t seem to mind, and the music outside was nice and loud. Problem solved, right? For a little while, it was. The thing about the Garden Room is that even though it’s on the always loud and busy Dickson Street (where 95% of the bars in Fayetteville are located), there are some apartments on the second floor of the building. Loud music + apartment dwellers (who freaking live on Dickson Street, what do they expect?) = noise complaint. So at about 10:30, I’m standing inside talking to the Beatys and Shannon, when two cops walk in. Shannon immediately goes over and says something to them that I can’t hear and they follow her outside. Needless to say, Jon, Emily and I are very confused. 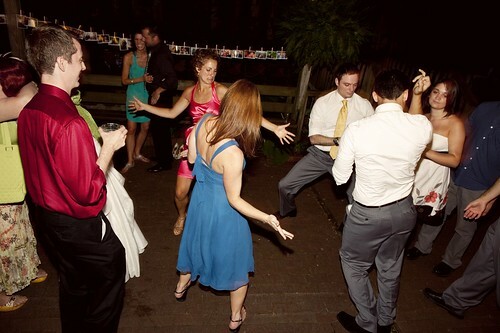 The best part is, outside the dance party was in full swing. Groomsmen Josh is doing the worm and backs right in to one of the police officers. Sadly, there is no picture documentation of this most classic of wedding moments, but I hear tell that someone has it on video. The cops were nice, said it happens all the time and that they were obligated to come, and quickly left. 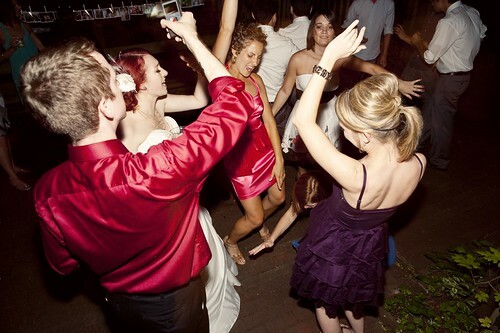 Just as I thought the reception was over, someone suggested moving the speakers inside. What happened next was so amazing that I’m having a really hard time describing it accurately. Everyone rallied and within minutes, we were back up and running. When we were making our dancing playlist, we had over four hours of songs and couldn’t seem to get it down to the two hours or so we thought we’d need. For the sake of time, we left the list how it was and figured we could just skip to the last song as everything was winding down. WE RAN OUT OF SONGS. As in, played every song on an over four hour playlist. 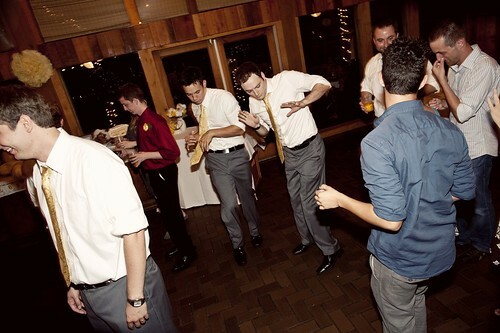 At one point groomsmen Randy was downloading songs by request on his iphone. Yeah, it was that awesome. 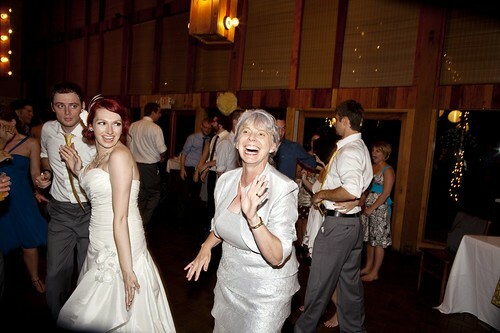 Yes, that is my husband and mother-in-law dancing in the middle of a circle of cheering people. Quite possibly one of the cutest and most hilarious things I have ever seen. 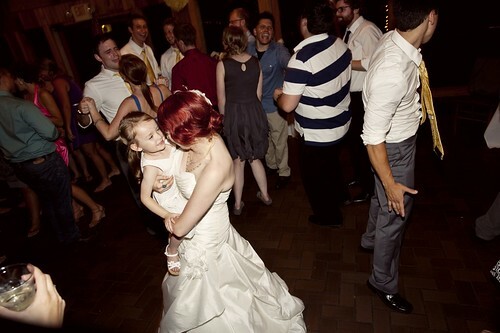 Around 1:30 a.m., there were still a ton of people dancing but Jacob and I were suddenly exhausted. 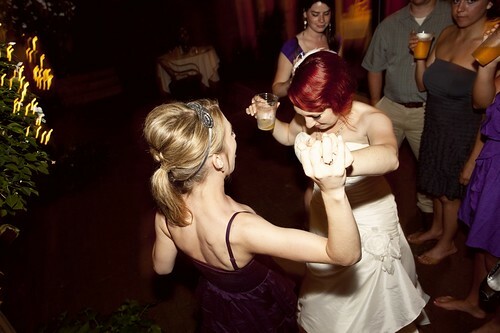 I’m pretty sure the dancing would have continued until the next morning if we hadn’t decided to play the last song, The Last Dance by ol’ Frank Sinatra to let everyone know we were ready to go. 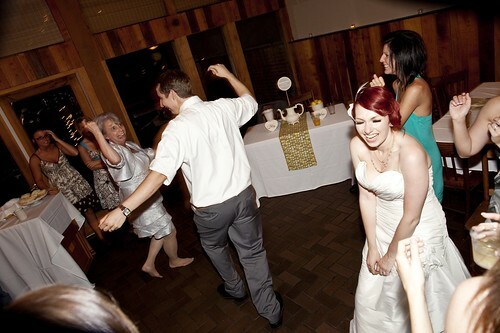 As soon as the song ended, we gave everyone hugs and helped the remaining family members clean off the tables. No fancy exit, no bubbles, no sparklers or rose petals. Just my husband and I loading up boxes of decor into our undecorated car and driving to our house to stay in our bed. It was the only part of the night without any fanfare, and the perfect ending to a day that was full of it. 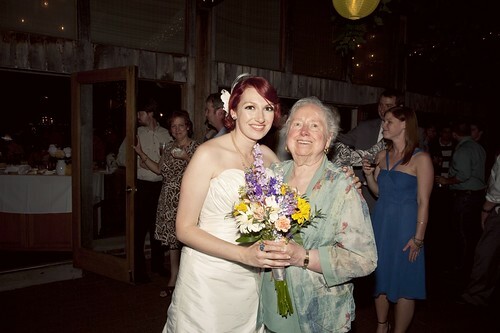 (insert long sigh of relief) There it is folks, the best day of my life in pictures and words! I still have a few more posts to do about the details, money saving tips, vendor reviews, and of course our honeymoon, but all of that will take place at my new site! The cop story is awesome!! It’s those unexpected moments that somehow stick with you the longest…and the fact that everyone rallied is fantastic!! What fun friends and family you have!! Love it!